Start your tour in the vibrant city of Yangon, where faded colonial buildings stand next to glittering temples. Delve in to the country’s history and diverse cultures as you tour museums, marketplaces, and the unforgettable Shwedagon Pagoda. Travel north to Bagan. Bagan has a timeless feel with thousands of majestic stupas filling the arid plains and the Irrawaddy River winding its way alongside the town. Spend your days exploring the temples and learning about the local culture and traditions. Before returning to Yangon, make one more stop to cruise the tranquil waters of Inle Lake. With the Shan Hills as a backdrop, you will explore local villages, cottage industries, and the unique way of life of the lake’s residents. Soak in the serenity and natural beauty from the view of your lakefront hotel. Throughout the journey, spend your evenings in elegance as you stay in some of Myanmar’s best hotels. In Yangon, relive the grandeur of the colonial days as you spend your evenings at The Governor’s Residence- a restored teak mansion from the 1920s. Sip cocktails whilst the sun sets over the Irrawaddy River from the luxurious grounds of the Thiripyitsaya Sakura in Bagan. And spend two nights in style at the Inle Princess Resort where luxurious food and rooms are equaled by the stunning views. Upon arrival at Yangon International Airport, our Exotissimo guide will greet you and assist you through customs and baggage claim where our staff will present flowers to you. Then, you will be transferred to the hotel. 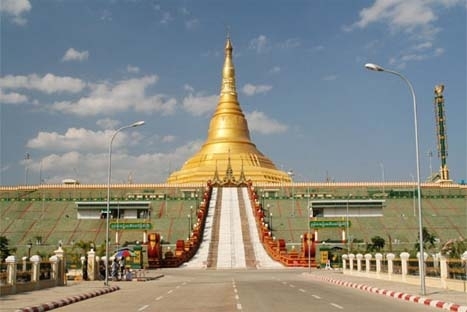 First we’ll visit Kyaukhtatgyi Pagoda, home to a 70-meter long reclining Buddha. A visit to Kyaukhtatgyi provides a great overview of Buddhism with murals depicting the life of Buddha, the feet of the statue carved with traditional symbols and often many locals gathering to pay homage and pray. Continue to a local tea shop for a chance to experience an integral part of Burmese life: drinking tea! Select from an array of snacks and enjoy a coffee or tea as you sit amid businessmen, friends and families who gather at the tea shop to socialize or conduct business. Next your guided tour goes to Kandawgyi Park, one of central Yangon’s greenest spots. Here you will see the glittering Karaweik barge, a replica of the royal barge, and the vast lake with views of Shwedagon in the background. Depending on the day of your visit Kandawgyi may be busy with local families who come here on the weekend to relax in the fresh air. The journey begins with a visit to an elevated temple with spectacular views over the surrounding plains. This is the perfect introduction to the grandeur and scope of Bagan’s architecture. Afterwards we will go to Myinkaba Village and visit Gubyaukgyi Temple which is noted for its beautiful mural paintings on its inner walls and well-preserved plaster carvings on its exterior. Nearby is Manuha Temple and Nan Paya Temple, two smaller temples with nice Buddha statues and stone work. Transfer to a monastery for a special monk blessing. This ceremony is an important part of Burmese Buddhist culture and is a great way to immerse yourself in the local traditions. Afterwards take a break for lunch at a local restaurant. This afternoon, visit Ananda Temple, an architectural masterpiece of the early temple style that contains four impressive standing Buddha images. Continue to the nearby Ananda Okkyaung, one of the few surviving brick monasteries from the early Bagan period and Thatbyinnyu Temple, Bagan’s tallest temple at 61 meters. Embark on a sunset horse carriage ride that takes you past dozens of temples - including Sulamani and Dhammayangyi - and the traditional village of Taungbi. As the sun sets, climb onto one of the upper terraces for panoramic overviews of the Bagan plains. After breakfast explore the town of Nyaung U and the neighboring villages where you can learn about the traditional livelihoods in this area. Discover the interesting process of creating Poneyay (pea powder paste) and see how local plum jam is made and packed. 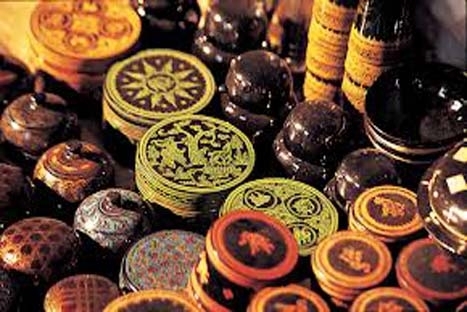 In addition, visit the workshops to witness the production of the region’s best known products: handmade lacquer ware and wooden handicrafts. At the villages, find out how cartwrights make the traditional bullock carts that are still used by farmers and locals throughout the country. This makes a great opportunity for hands-on activities as the local craftsmen often love to share their techniques with visitors. Continue to a local village where a private lunch is set up. Enjoy a walk through the village and meeting the local residents as you make your way to a shady area where your lunch awaits. Dine on freshly prepared traditional dishes in a quiet corner of the village, a unique experience that is sure to be a fond memory of your trip to Myanmar. Later this afternoon, board a private river boat and set off upriver toward Kyauk Gu U Min. Throughout your Irrawaddy river cruise you will be treated to fabulous scenes of life on the water: fishermen, local ferry boats, riverside villages and views of the Bagan temples. You’ll stop at Sae Lan village and go ashore for a short walk. Sae Lan is typical of the riverside villages along the Irrawaddy. The friendly people work as farmers and fishermen, living a simple but happy life. Continue by boat to Kyauk Gu U Min on the eastern side of the river where a five to ten minute walk takes us to the temple. This beautiful temple has exquisite stone carvings depicting religious figures and flowers on the door. The temple itself is built against the side of cliff, so behind the main hall of the temple you can enter a cave. Inside the cave there are several small niches where individuals can practice meditation. Legend states that the cave was built during the 13th century for the locals to hide from the invading Mongols. After your exploration of Kyauk Gu U Min, you’ll return to the boat for a relaxing cruise back to Bagan with a cold drink served on board (around 1 hour). 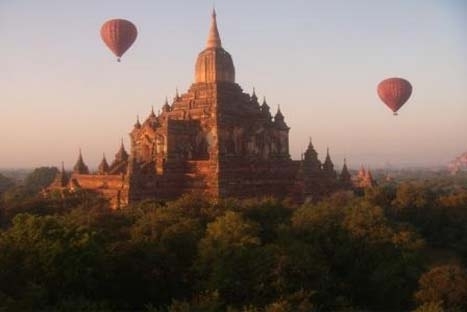 Transfer back to your hotel upon reaching Bagan. After breakfast, transfer to the airport for a domestic flight to Heho. From Heho, a one-hour scenic drive leads to Nyaung Shwe, the gateway village to Inle Lake. At Nyaung Shwe, board a private motorboat and head out to Inle Lake, one of Myanmar’s most spectacular sights. Sailing past stilt villages inhabited by the local Intha people, observe the one-legged rowing techniques of the Intha fishermen and see their floating gardens unique to the area. After lunch, visit Phaung Daw Oo Pagoda, the lake’s main sanctuary and home to five revered Buddha statues. Your sightseeing trip also encompasses a visit to the weaving village of Inpawkhone, a cheroot factory where typical Burmese cigars are made by hand. After breakfast, a 1-hour boat ride leads to the Pa-Oh village of Indein, one of the small villages situated on the western bank of Inle Lake. Take a slow stroll around the village and the local school before ascending the covered stairway to the top of the hill. At the summit, a Buddha image sits enshrined amid hundreds of ancient stupa ruins and overgrown bushes. You will also be rewarded with mesmerizing views of the surroundings from the peak. Then, embark on a 1-hour trek to Kyar Ton village. Along the way, enjoy the natural beauty and panoramic vistas of the area while walking under the shade of bamboo grooves. Upon arrival at the village, observe the daily lifestyles of the rural inhabitants before enjoying a gourmet picnic lunch in the village. After lunch, transfer back to Tharlay village on a canoe boat ride (1 hour) which provides views of the picturesque Inle Lake and up-close interaction opportunities with the Intha people to learn about their traditional one-legged rowing techniques. Then, transfer back to your hotel on a private motorboat. Relax at your hotel or opt for a massage at the luxurious spa (prices vary depending on treatment) or indulge in a wine tasting of international and regional wines (25 USD per person). After breakfast, transfer to Heho airport for a short flight back to Yangon. Your guide and driver will be at your disposal for the remainder of today for last minute shopping or sightseeing. The remainder of today is at your leisure for additional sightseeing or shopping before transferring to the airport for your onward flight. For those with more time we recommend joining one of our exclusive day trips to further explore the wonders of Yangon. Below are just a few ideas you may enjoy- ask your travel consultant for more details or additional ideas.